Here’s the situation: It’s Wednesday afternoon, and I’ve arrived home with the intention of thawing and preparing a container of homemade soup for dinner. As I reach behind a half-empty bag of frozen sweet potato fries for the solid mass of vegetables and broth tucked in the back, I realize that this will be the fourth time I’ve eaten soup for dinner in the past week. The thought of slurping down yet another bowl is wholly unappealing. I consider the contents of the fridge, and realize that it’s not properly stocked. There’s no more fresh protein on the top shelf. I’ve used half of the veggies that I bough on Sunday. The baguette is gone, as is the basil, tomatoes and roast beef that I bought last week, and braving the mean streets to make a run to the store is as appealing as falling down the stairs. So I take another look. I have tortillas, cilantro, and all the fixin’s for a healthy bowl of guacamole. That’t green enough to be considered a vegetable! I also find two small fillets of salmon which had somehow slipped behind a tray of lasagna (jackpot! there’s dinner for tomorrow!). Annnndddd I’ve found my protein. Clean the piece(s) of salmon and pat them dry. Mix the spices (brown sugar, chili, garlic, cumin, coriander, dried cilantro) in a bowl, and rub a generous amount of the spice mixture on the flesh side of the salmon. Allow the spice rub to sit on and soak into the fillet(s) as you prepare the remainder of the ingredients, which should take about 10-15 minutes. Prepare the guacamole (check out the link above). Chop the cilantro, slice the lime, and prepare the tortillas. Heat the oil in a large frying pan set over medium heat. Make sure that the pan is large enough to fit the piece(s) of salmon. Place the fillets flesh side down, and cook for four minutes. The sugar mixture will cook into a nice, crispy crust, which gives this dish not only a nice flavor, but an interesting texture. Flip the fish onto the skin side, and cook for no more than 1-2 minutes. This evens out the cook, and makes the skin very easy to remove. Remove the fish from the heat, peel the skin off, and chop or flake the fillets. 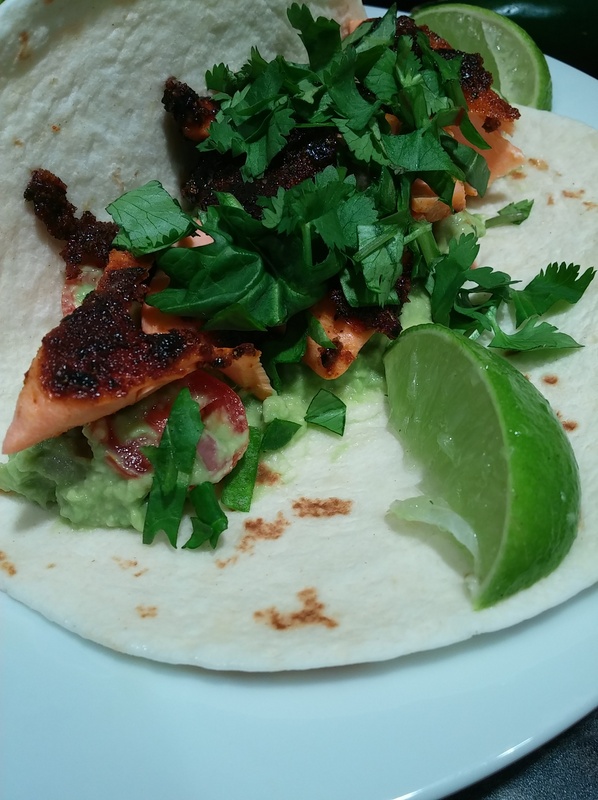 Layer the guac, a handful of fish, a sprinkle of cilantro, and a squeeze of lime onto each tortilla. As always, enjoy with beer. This looks delicious! Suddenly, I’m craving salmon tacos. Thanks for the inspiration!